Otto Magnus Andersen as a young man. Otto Andersen was a Norwegian seaman who had achieved rapid promotion in his profession and was something of an entrepreneur alert to possibilities. He had bought the motor vessel Majong from the British United Investment Corp. Ltd, London in November 1924 and registered her at Bergen, Norway as Lillehorn owned by G. Andersen. Gudren Andersen was Otto Andersen’s wife. He sold the Lillehorn at a handsome profit in April 1925. The Majong had been built in the Wivenhoe shipyard by Rennie, Ritchie & Newport Shipbuilding Co. Ltd and, on learning that the yard was also for sale, Otto Andersen bought that too, in February 1925. Lying at the newly acquired shipyard of Otto Andersen & Co. (London) Ltd was the Majong‘s uncompleted sister ship, yard number 1328, which was the sixth and last of nine vessels which had been ordered in 1914 by the by now long bankrupt Maindy Shipping Co. of Cardiff. The Maindy Transport, Maindy Tower of 1920 and the Maindy Keep of 1921 had been completed for the original owners, but the Maindy Shg Co. went into receivership and the Maindy Cottage was completed on behalf of the receivers in 1922 as Stockrington for J. & A. Brown & Abermain Seaham Collieries Ltd, Newcastle, N.S.W. The remaining five ships were cancelled, as were the Plenty & Son steam engines, and the shipbuilders were left with two incomplete hulls and no engines for them. Rennie Ritchie & Newport had fitted the Majong with Bolinders diesels, and the empty husk of yard number 1328 remained to help the company into receivership. 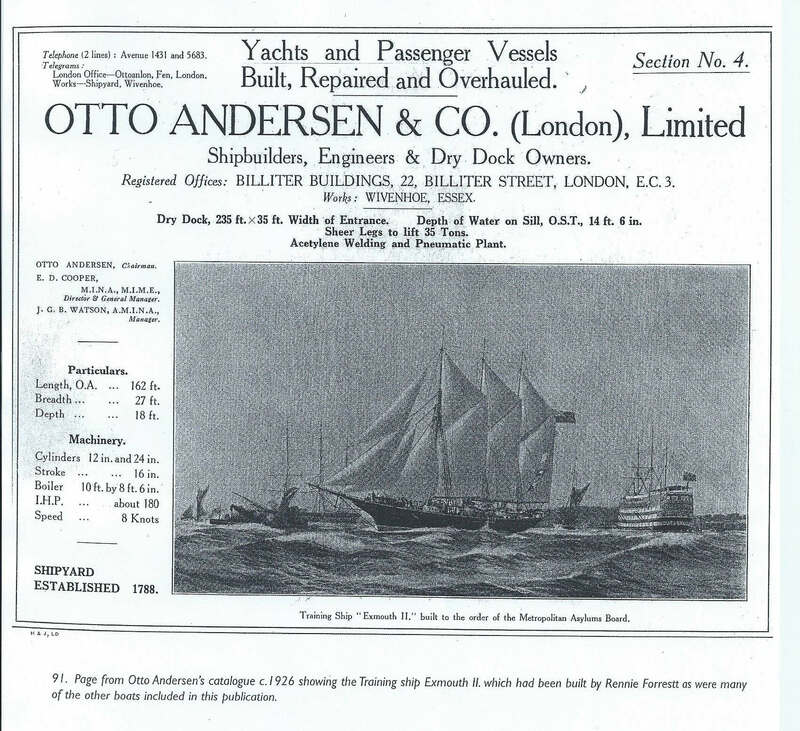 An advert which appeared in Otto Andersen’s catalogue of around 1926 showing the training ship Exmouth II which had actually been built by Rennie Forrestt, the company that had previously owned the yard. Yard number 1328 had been launched, unnamed, in January 1922 and laid up, and she must have been in a rather decrepit state by 1925, though no doubt she had been coated with enough red lead to keep her a bit rust free. She was partly completed in 1927 and towed to Holland for engines and fitting out. She at last got a name, Hopsborg after Otto Andersen’s home in Norway. In 1928 Hopsborg was converted into a tanker. She was later sold, again at a comfortable profit, to Santa Maria S.S Co. Ltd, London and renamed Unacano. Otto Andersen kept the shipyard ticking over, because by the early 1930s he had, on a visit to Germany, got a premonition of World War Two! He knew that with war, or even a seriously perceived threat of war, shipbuilding would again be in great demand, and he would have the choice of operating, or selling, the shipyard at a profit. There was little demand for ships at that time, he did lease parts of the yard, and build two small vessels and some pontoons for the War Office, but this was insufficient to pay the interest on his mortgage. The main, steady, source of income was the leasing of the dry dock to Mr Bayard Brown for him to keep his big steam yacht Valfreyia in. When Bayard Brown died, the end of the Wivenhoe shipyard was ensured. The Valfreyia left the dry dock, the rent stopped and Otto Andersen in 1936 was forced to sell. The yard was bought from the mortgagees by National Shipbuilders’ Securities Ltd, and closed down. Part of the constitution of the new buyers was that the yards should be ‘sterilized’ and no steel ships allowed to be built in them for forty years. Otto Andersen bought a hotel in London, made money and soon owned several hotels. His one last venture in the shipping business came in early 1940. Britain was already feeling a shortage of ships, and Norway and the Netherlands were still neutral. 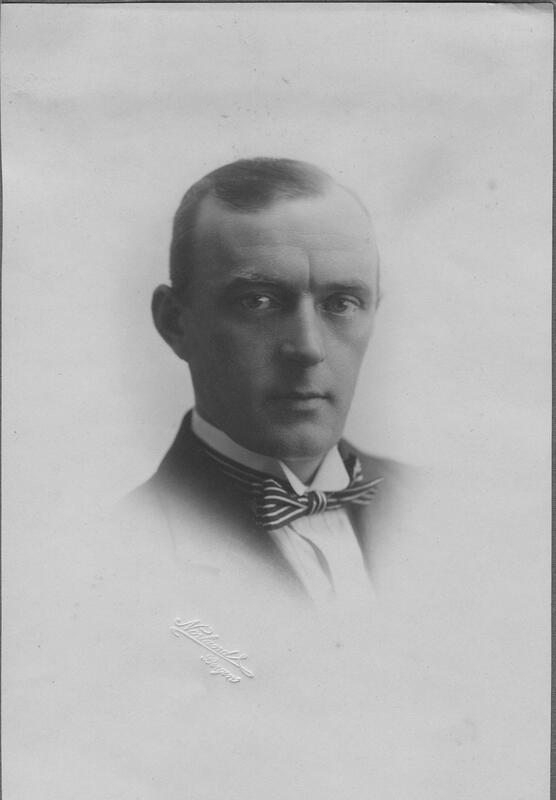 The Dutch Government had forbidden the sale of ships to belligerents, but the Norwegian Government had not, so, with an open door to the Ministry of Shipping’s cash, Otto Andersen went to Holland as a neutral Norwegian citizen and bought a batch of Dutch coasters, and within hours had sold them to the British Government, this time without a profit. He was born 21st January 1884 and died in Paris on 5th February 1948. See also: McEvers Bayard Brown. Foootnote: National Shipbuilders Securities was a UK Government body established in 1930, under the Chairmanship of Sir James Lithgow, of the eponymous Clyde shipbuilding giant Lithgows. The remit of National Shipbuilders Securities was to remove over-capacity from the British shipbuilding industry. Between 1930 and 1938 it bought numerous shipbuilders that were in economic difficulties. It closed and demolished most of the shipyards it bought. This page was added on 30/04/2015.